Classic - it's a word that we have all heard when it comes to literature. If you pin that label to a book, I instantly feel a reluctance to touch it, let alone read it. I realize this, embrace it, and then fight against it. I force myself to read so many a year in exchange for a reread of one of my favorite sci-fi/fantasy novels. But honestly, what defines a book as a classic? Popularity? Critical reception? A bunch of old, white guys in a tiny room? *shrugs* Who knows? I like how Esther Lombardi breaks it down on About.Com. A classic makes connections. 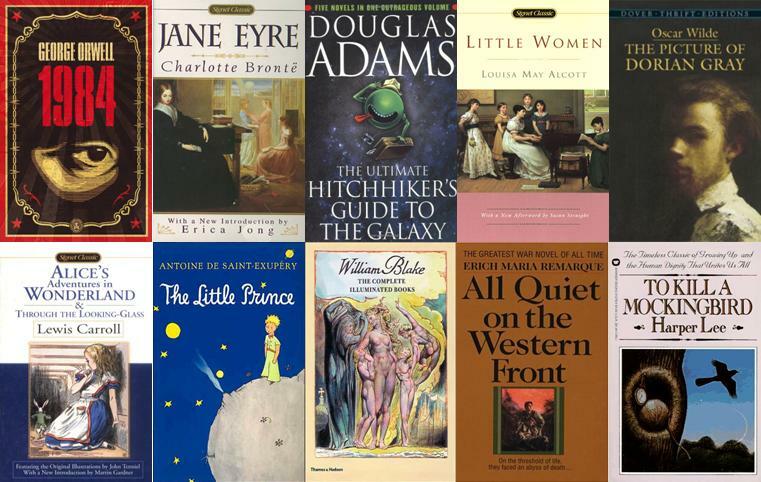 You can study a classic and discover influences from other writers and other great works of literature. Of course, this is partly related to the universal appeal of a classic. But, the classic also is informed by the history of ideas and literature--whether unconsciously or specifically worked into the plot of the text. Sure, I am probably missing something awesome. Maybe I'll think of it later and kick myself. Would you like to help me along? What are some of your favorites in classic literature? Is there anything that you think will be considered "classic" in the future? I think The Count of Monte Cristo is a fantastic book, in the traditional classics way. And I think the Harry Potter series will be a classic, in a strange non-traditional way.. soon. I'm like you - as soon as it has the 'classic' label attached, I run in the opposite direction. I've read 5 of the books on your list, but more because of school than anything. Maybe I'll try in intorduce myself to one a month from now on! 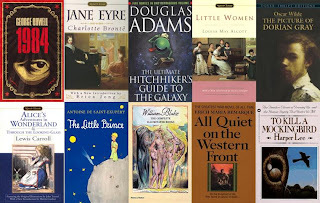 Fave Classics: The Sherlock Holmes Canon, The Three Musketteers, Pride and the Predjudice, Julius Caesar, Huck Finn... etc. I make a point to read them. I am SO bad at reading 'classics' - but then I also struggle with the definition - published more than 50 years ago, more than 70 years ago? There are some great apocalyptic/dystopic classics - 1984 and Day of the Triffids are two of my favourites. I *love* the old school apocalyptic, sci-fi, and the like, too! I haven't read Day of the Triffids, but it's going on my TBR! Watership Down is one I think of--I still remember the scene of the rabbits contemplating how to get across a stream, and I read it 30 years ago! Hi Kayla - you hit two of mine: Little Prince (I have it in German and English) and Jayne Eyre. I love Pride and Prejudice (have probably read it five times) and an all time favourite...is JM Barrie's Peter Pan. Thank you! I keep telling myself that I'm going to buy a French edition of The Little Prince, so I can read it in the original language. I should probably reread Peter Pan - it's been at LEAST 20 years! 1984, Jane Eyre, To Kill a Mockingbird...awesome choices. Former English major here and I LOVE your challenge theme. Thanks! Yours is so freakin' awesome, too! I lurve your C post!